Do the regular subscriptions get the Station Cash also? Since they get the 500 SC per month that is a $5 “discount” with the platinum option, assuming that people use it. I have no plans to get back to LOTRO when they change the business moel, but I would consider playing EQ2 again. NCSoft needs to do this with Auto Assault… please? At first glance, the one issue I have with the SILVER level plan is the spell and equipment limitations. Limit the gold, the bags, the content, but set the character free. I should want to buy from the shop because it enhances the fun I am already having, not because my character is weaker if I don’t. Also, you’re right that it’s a cataclysm in MMOs that, or rather a building avalanche, but not the kind that Wolfshead likes. I expect this will inflame him to an even greater degree, and much merriment will ensue. I’m actually fine with the two lower tiers (with the exception of the Spell Tiers limitation… not liking that at all), but what bothers me is the two levels of subscription. I feel like if someone subscribes, there should be no limitations. And having an Elite Subscription should provide much more than the same access the subscription server people get but for more money. But whatever, I’ll give it a whirl. I enjoy EQ2 much more than DDO, and I’ve been playing that here and there, so maybe this will get me to play the game for more than a month every year and a half or so. Domino effects are interesting; they are classic market functions. What’s most important to remember is that the leaders always make out the best when the dust settles. Chasing trends is never as profitable as making them. I maintain that WoW should have made vanilla WoW free to play (OK, the GW model, buy the box, play forever) even before DDO made the shift. *That* would have been a cataclysm, with Blizzard riding this inevitable business model conversion wave, rather than counting on their inertia to make the wave break around them. Even still, they could do that to vanilla WoW and cut the wind from everyone else’s sails. Let free players get hooked on vanilla WoW, then upsell them to the expansions. Tease them with Worgen and Goblins and pretty screenshots, but get them hooked on the game for free, then reel ’em in. Platinum level is probably a test. There’s been speculation for a while that there’s a group of special snowflakes that would pay more for a premium service, even if that premium service was just the illusion of exclusivity. Sparkle ponies have shown that people are happy to spend more money if given the opportunity. SO are merely giving players to spend more money in their favourite game. Free-to-players and subscribers are on separate servers? That’s interesting, given that one of the main complaints from LOTRO players was that they didn’t want free-to-play people flooding “their” servers. so 14.99 per month, and you can’t even reach the level cap without paying more. You are capped at 80. Every single payment option is limited to 4 races, even the 16.99 one. Although they can use the station cash refund to buy it hopefully. Only the 16.99 per month comes with sentinel’s fate. No wonder its a separate server, if they rolled these changes onto the live one there would be such anger it wouldnt be funny. Syp, this is not intriguing, this is cash farming. While this new development will most definitely bring me back to EQII (since the main factor that prevented me from subscribing was that I was already having too much fun in GW for free), I am nonplussed by the “top” two tiers – if you subscribe to the game, you should get access to everything, period. I’m not sure why anyone playing on the Extended servers would abide that paywall. I’m not interested in the subscription options on the free server — I think they’re a mistake, frankly. What I want to see are the store options for freebie players to purchase levels 80-90 and other locked content. 80 levels for free does seem like a heck of a lot, tho. Even if you are concerned about that, sub players in a F2P game matter because they help subsidize the revenue lost between people who play for free/buy very limited content piecemeal. It makes sense for F2P games to have good sub options because that lets more people play for free or for less-few subs means more required content. The subs are supposed to be a savings on buying all the content piecemeal. Its no good for you to be level 90 if you don’t increase your bag size, be able to wield all tiers of magic and equipment, and have a decent amount of character slots. If they aren’t, well the cost piecemeal will be worse. You just wont see if until you get into the game and need more than basic stuff. What attitude? If people want the full game subscription thing, they can do it on a regular server. There’s nothing stopping them, and they’ll get everything they want. If they want the F2P experience and add on to it with microtransactions, then they’ll have a new route for that. The subscription on the F2P server is redundant and a lesser form, and doesn’t need to be there from what I can tell. I agree Syp, the subscription options on the “Extended” server just seem weird and unnecessary. It would make sense if this was the sole pricing setup replacing the existing subscription game, but as something running alongside it on different servers, I can’t see the point. It matters because the “subs” on a F2P game make the things affordable. I can’t get into the DDO store beyond the webfront since I don’t play it, but it looks like just buying a single race is over $6. Some options are over $10. If you play the game heavily you’ll spend a lot more than a monthly sub that way. Its a one-time fee but there are a lot of those fees. Microtransactions for content only work if you don’t plan to play the game much at all-even in F2P games their monthly fee options are better. The attitude is focusing on our own playstyles to the exclusion of others. Too much of the F2P debate is not listening to people who will use the F2P services heavily, and instead focusing on light users. I’m not saying the F2P model is bad in this, but the way its set up is bad for all heavy users on F2P and even sub servers. Dblade, Syp isn’t saying that having a subscription option isn’t a good idea. He’s saying that he’s having two similar but separate subscription options (the “Extended” gold membership, and the regular EQ2 subscription plan) isn’t a good idea. How will the F2P servers last if all the heavy users abandon them to the sub servers because its not worth spending the money? You need to get heavy users on those servers, because otherwise they wont make enough money. They can’t transfer over, so far its just from sub to F2p. I’ve never seen a F2P game survive without heavy users, but this model seems to punish them. It is an experiment. 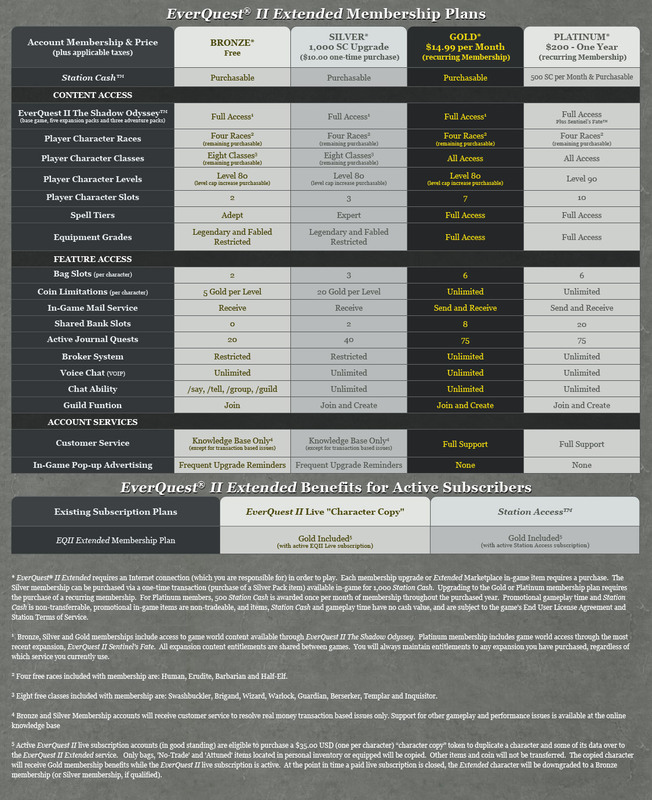 If the subscription options they have for EQ2 Extended do not work out, they will likely change it. Obviously someone has done some calculations and hope that these offerings will work out. If they don’t, they will adapt. I am happy that they are taking the step to provide more diverse payment options and that they (or any other MMO company) will adapt details based on consumer response. I think what needs to get creative is the box costs of a game. When I try an MMO with a free trial that will inevitably cost a box fee, I totally dump the idea. I can’t get over the fact that I have the product on my computer, yet they want me to pay anywhere between $20-50 to unlock the game and then on top of that the monthly fee. I think this is a shrewd move by EQ2 for people like myself. After reading about the move to F2P I checked out how many races and classes EQ2 has and it blew me away. If they price individual or groups of races and professions properly it could really buoy their income. Finding the exact price point though is the tough job. Sounds like Sony has made another “NGE” mistake. With F2P servers getting most new players, the old servers will slowly die off. What on earth is Sony smoking these days? If I ever play EQ2…I’ll be staying away from the “Extended” servers for sure. Am I missing something important here? Why on earth would someone take the EQ2 Extended gold subscription when it costs exactly the same as the EQ2 Standard subscription, but gives you a lot less?? Llokki.. I assume because they are already playing on the Extended servers and have gotten invested in their character, made friends/joined a guild there, and don’t want to leave them behind (and pay a $35 fee!) to transfer to a “real” server. It is so bad that people refuse to play WoW because it is WoW. Yet at 15 dollars a month it is still facing no issues. Will anything end the 6 year reign of tyranny this game has wrought upon our community?